There’s a common myth about entrepreneurship that the only way for you to build your business is to quit your job, max out your credit cards and by all in 100%. That might be true for a handful of people, but it’s not the case for most aspiring entrepreneurs. Adan Perez busts that myth by sharing why transitioning into entrepreneurship was the best option for him and why it might be for you too. 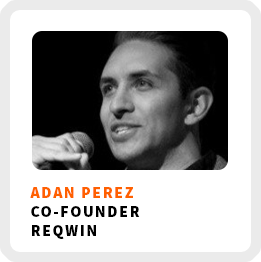 He’s the co-founder of REQWIN, a platform to make the management of government contracts more efficient for contractors. He also consults other business on the development of their digital products. Why your initial customer interviews are so important for building a solution people want to buy. The process Adan uses to create prototypes for his digital products. How he acquired skills for entrepreneurship before going full time on his own. Why planning is so important for managing his time. The importance of getting out into the world to build new relationships. Ideal work environment: In noisy environments where there isn’t one predominant sound to focus on, like in a coffee shop or in his home office with music playing. Superpower: Getting laser-focused on things, which can good most of the time, but not always. Self-reflection practice: Clearing his head of thoughts and background information that can influence the thought path as well as meditation once a week. 90-day goal: Make everything he’s doing more successful by outlining an MVP for some clients and scale the beta he’s developing for REQWIN. 1) Build a large audience to approach because it’s a game of numbers since many people may not respond to a cold email or call if you’re just beginning to engage with your community. 2) While it’s valuable to find new contacts on something like LinkedIn, don’t overlook talking to people you already know. 3) Never close any doors because you never know who you might meet and what may come of it.